Volunteers truly are the lifeblood of PPA and its Affiliates. Every association has those extraordinary volunteers whose efforts on behalf of the Affiliate and its members deserve special recognition. Seeking a way to thank these individuals, Professional Photographers of America created the National Award in 1958. Each year, PPA makes this prestigious award available to state, regional, national and international affiliates – who then present it to deserving individuals. 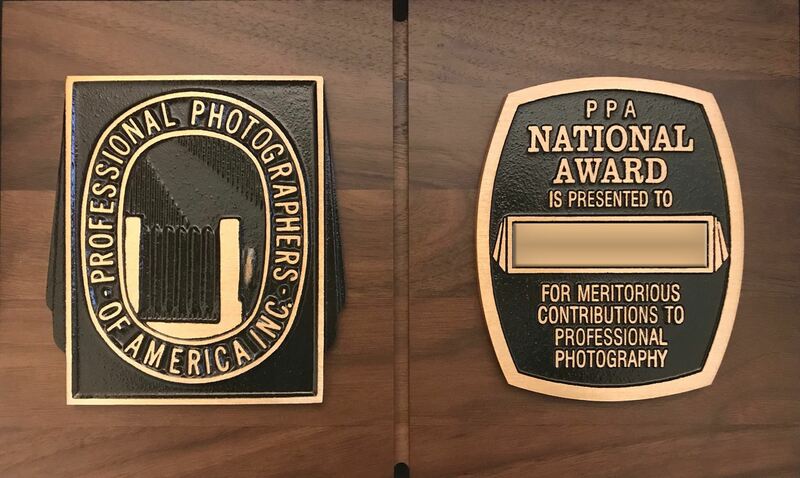 The highest honor granted by a PPA Affiliate, it recognizes those whose support for photography goes far beyond any regular expectations or contributions. The simple inscription on this plaque reads “for service to professional photography” – but we know that this award means far more than that. The National Award is offered by PPA to state, regional, national and international affiliated organizations on a yearly basis. First made available in 1958, the award recognizes those who generously contribute their time and talents to the service of their profession, their affiliated organization and their fellow photographers. Selections of the award are determined by the recipient’s peers, adding to its distinction and value. PPA is the largest international non-profit association created by professional photographers, for professional photographers. Almost as long-lived as photography itself, PPA has roots back to 1869 and is now headquartered in Atlanta, Ga. It has never stopped growing and looking for new ways to assist its now 26,000 members through protection, education and resources for their continued success in the industry. See why photographers love PPA at www.ppa.com.